Product prices and availability are accurate as of 2019-03-26 17:03:16 EDT and are subject to change. Any price and availability information displayed on http://www.amazon.com/ at the time of purchase will apply to the purchase of this product. (HCPCS Code: NO CODE) ECOS All Natural Liquid Laundry Detergent ( DETERGENT, LAUNDRY, FREE&CLEAR, 5GAL, PAIL ) 1 Each / Each. Dimensions: 12.25 x 12.25 x 14.75 ; ECOS can be used in H.E. machines or standard machines. Helps keep colors vibrant and the integrity of fabric. Free & Clear formula does not contain any scents or fabric softener making it ideal for nursing homes and micro fiber care. Made with only 100% sustainable, plant-based ingredients. Non-toxic formula does not contain dyes or synthetic perfumes, neutral pH, greywater and septic safe. Product licensed and manufactured by Earth Friendly Products. 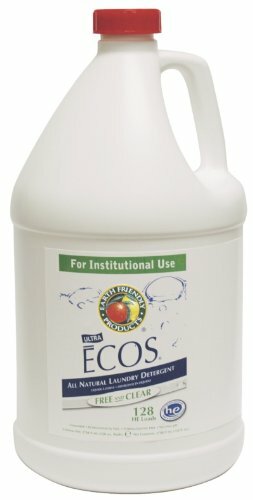 ECOS All Natural Liquid Laundry Detergent products carry a limited lifetime warranty. Further information is located on the manufacturers website.